The DOJ announced charges against 12 Russian intelligence officers for hacking offenses during the 2016 presidential election. The indictments were announced by Deputy AG Rod Rosenstein as part of Mueller's counsel probe into potential coordination between the Trump campaign and Russia. The charges include conspiracy to commit an offense against the U.S., conspiracy to launder money, and aggravated identity theft - along with releasing the stolen emails on the web. The Russians are accused of hacking into the computer networks of the Democratic National Committee, the Democratic Congressional Campaign Committee and the presidential campaign of Hillary Clinton, and then releasing stolen emails on the internet in the months before the election. Of course, that probably means that someone at the DOJ finally has access to the DNC Server - i.e., Exhibit A - which oddly enough, nobody from either the CIA or FBI had asked to see at the time of the alleged hack. “The object of the conspiracy was to hack into the computers of U.S. persons and entities involved in the 2016 U.S. presidential election, steal documents from those computers, and stage releases of the stolen documents to interfere with the 2016 U.S. presidential election," the indictment reads. That said, the DOJ admits that no Americans were involved in these efforts, and the hacking operation did not alter the outcome of the election. The White House issued a statement on Friday declaring that the indictment is "consistent" with President Trump's claim that there was no collusion between his campaign and the Kremlin. The accused individuals are also said to have used cryptocurrencies to mask their identities as part of the scheme - employing Bitcoin to buy servers, register internet domains and make payments to people involved in the hacks, according to the indictment. They also "mined" bitcoin to help bankroll the operation. Also notable - "a candidate for the U.S. Congress" who is not named contacted Russian operatives who were posing as "Guccifer 2.0" to request information stolen from the DNC's email server. "The conspirators responded using the Guccifer 2.0 persona and sent the candidate stolen documents related to the candidate's opponent," the indictment reads. "On or about July 27, 2016, the Conspirators attempted after hours to spearphish for the first time email accounts at a domain hosted by a third-party provider and used by Clinton's personal office. At or around the same time, they also targeted seventy-six email addresses at the domain for the Clinton Campaign." And while the language and descriptions of "hacking" are sufficiently vague, the indictment lays out a "spearphishing" campaign of obtaining user credentials by tricking people into giving them up, followed by more commonly understood "hacking" techniques involving the infiltration of networks and the use of malware. Meanwhile, the White House issued a statement through a highlighting the fact that the indictment clearly states that no Americans were involved with the alleged conspiracy (poking still more holes in the government's already crumbling Russia collusion narrative). 'There is no allegation in this indictment that Americans knew that they were corresponding with Russia." There is no allegation in this indictment that any American citizen committed a crime. Today's charges include no allegations of knowing involvement by anyone on the campaign and no allegations that the alleged hacking affected the election result. This is consistent with what we have been saying financial." The Russian agents allegedly created fictitious online personas during their operation, including the Guccifer 2.0 persona, which was previously believed to be a Romanian hacker, as using cryptocurrencies to pay for various computer equipment, including in the US. Russian GRU intelligence officials are also charged with using a third-party (which is not named in the indictment but sounds a lot like Wikileaks) to distribute the information (see reference below). 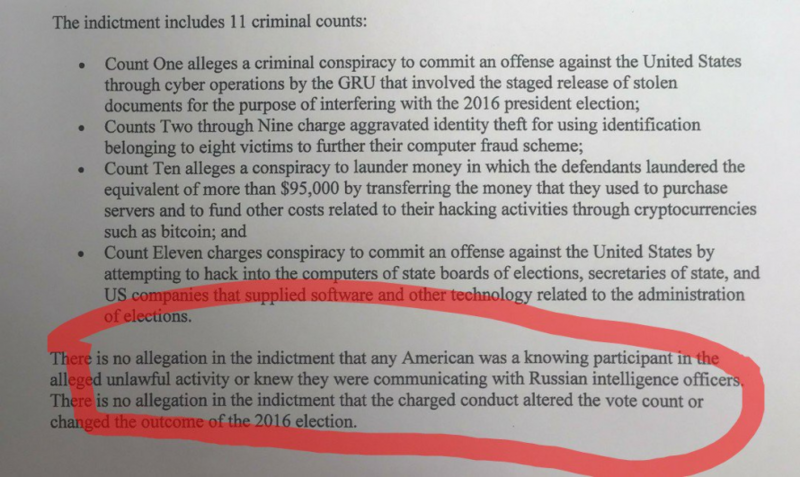 But most interesting was the admission at the end of the indictment, according to which there is no indication that any American was a knowing participant in this activity, and no indication that these efforts altered the vote count in any way. Rosenstein said he had briefed President Donald Trump on the indictment, which strategically comes just a day before Trump's meeting with Vladimir Putin. 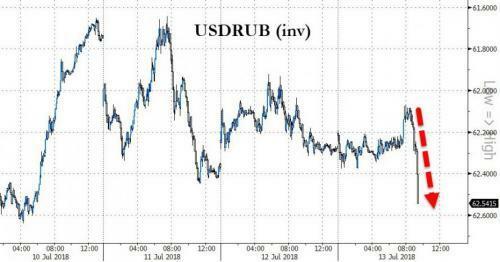 It is therefore no surprise that the Russian ruble reversed its earlier gains following the announcement. While the timing of the indictments is certainly curious, Rosenstein insisted when asked by a reporter that the timing is purely a coincidence and not the result of political considerations. 14/ How “co-incidental” for Mueller/Rosenstein to release more unprosecutable indictments 18 hours after Strzok’s train-wreck appearance in Congress. Most big Mueller announcements came at a time when there was bad news against the Obama DOJ/FBI or him.